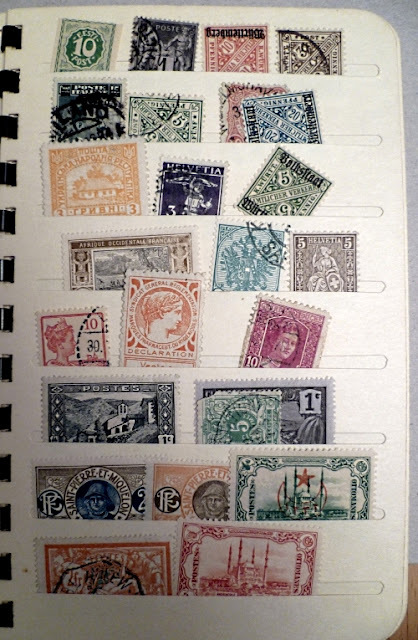 I've lately been tinkering with the combined stamp collections of my grandparents and my middle-school self, along with a rather hefty volume of used stamps that I've apparently been squirreling away in various containers, semi-consciously at best, for the past twenty-five years. This small "stock book" stands out among Grandpa's collection as containing a particularly interesting and old stash of loot. Whether the stamps in it were purchased by him from mail order companies, or traded, or if he just bought the whole book at a garage sale -- there's no way to find out now. But it has a lot of sweet stuff in it. The very first stamp in the book is from IAT(fL&TM5K) MFN Estonia. Imperforate, baby! When I first saw this stamp back in the day, I would have had to do some research to discover that "Estonia" was a historical entity that had been briefly independent between the two world wars. But what's up here? Well, at the end of World War I, Germany is falling apart at the seams. The Kingdom of Württemberg, which had been a constituent part of the German Empire since unification in 1871 -- but still independent enough, apparently, to keep printing its own postage stamps -- undergoes a bloodless revolution and becomes a "Free People's State." Sounds pretty radical, but in practice it really wasn't. That notwithstanding, new regimes never like using the old regime's postal iconography, yet there's not the time and money to rush a new set of stamps to the printers. So what do they do? "Overprint" the old "Kaislerliche Württemberg" stamps with the words "Volkstaat Württemberg," which makes the point for the interim. The Volkstaat would produce a few original stamp series over the next few years before being fully reabsorbed into the Weimar Republic in the early 1920s. Hey, it's Queen Wilhemina of the Netherlands! The stamp is from anywhere between 1913 and 1932, and is for use in the Nederlands-Indië, or as we say the "Dutch East Indies," or as it is these days: Indonesia, the third most populous country on the planet. As recently as a century ago, Europe still had tiny remnant states left over from its -- wait, what? Oh, right. Well! Here's a nice portrait of Grand Duchess Marie-Adélaïde of Luxembourg (r. 1912 - 1919), a pleasant-looking woman who had a long neck but a short and not especially happy life. If you hadn't guessed, I just love the line engraving on these old stamps; this one is from between 1914 - 1917. Andorra is even quirkier than Luxembourg. It's a "country," kind of, under joint French and Spanish administration, and both the French and the Spanish can and do issue Andorran stamps. Until the 1930s, they just used their own existing stamps and overprinted "Andorra" on them, but in the 1930s, as far as I can tell, the French administrators decided to give Andorra a stamp series of its very own. Here's the cheapest of the "Chapelle de Meritxell" series. Did you know that when France punted on its North American empire, it hung on to two little islands off of Newfoundland? True story. Saint-Pierre et Miquelon. They've got a combined population of about 6000, but nevertheless find it necessary to print dedicated stamps for themselves rather than just use regular French stamps. Why? Well, because people collect stamps, of course, and this allows the local postal service to sell lots of tokens for postal delivery (ie. stamps) that will never get redeemed. Grandpa, for instance, never sent mail using these "fisherman" stamps that were issued from 1909 to 1930, and I suppose I won't either. I do, however, recommend that you hunt down the very fine 2000 movie "The Widow of Saint-Pierre." And finally: for some reason, I never feel more connected to the past via paper ephemera than when I groove on the fine engraving of: Ottoman stamps! 4th most populous, or am I missing something. Yeah, you're right. I thought of that earlier tonight. Now it's Istanbul, not Andrinople??? Or is that nobody's business but the Ottomans? Edirne was Andrinople. Now it's Edirne, not Andrinople. Been a long time gone, Andrinople: now it's Turkish delight on a moonlit night.